**This poll is closed and the 'results' are collated here. See also the Songs for Six Strings Boxed Set Poll. I am sure most of you have enjoyed the 'Songs for Six Strings' CDs that Ralph has released. There is of course talk of more to come. As you can see from the interview, hopefully this will include Ralph's spoken introductions, which have become a feature of his concert performances. Have you any favourite songs you would like to see included on the 'Songs for Six Strings' series? First of all a confession of a sin of omission. My copy of Six Strings mark one, lives in the Lake District and is always a pleasure to rediscover when we go up to our cottage. However, looking at the cover last time we were there, to my amazement I saw it’s Volume 2. I have somehow failed to obtain number one! I will try to put this right when I order Water of Dreams. Meanwhile if any of my choices duplicate volume one of mark one , then apologies. Streets of London - A Cappella version with Show of Hands - A MUST! Birdman ... is there a live version of this anywhere? Icarus survived - if it exists live. 1. One Too Many Mornings. One of Bob's finest and saddest songs- Ralph really sings this song beautifully and I prefer it with guitar rather than keyboard. I have heard him sing this a few times and it sounds like one of his own! Any archives of this old classic- he used to sing it some years ago a la Chet Atkins style. 6. Standing Down in New York Town. I would like to see the following on future Songs for Six Strings albums by Ralph. 1. Let Me Fly or Let Me Fall. 2. In the Bleak Mid Winter. 7. Make It Go Round. ** I was sorry to learn from his daughter, that Stuart has recently died. I am sure he had contact with others who have visited this Web Site. Our thoughts are with his family. 1. Small Voice Calling - RNCM, Manchester, 1999. No surprises there then, Ralph! 2. Tickety Boo - RNCM Manchester, 1999. The only available sung version I know of is on a Billy Connolly video! 3. Streets of London - Royal Albert Hall, 2001. I would love to see my very favourite song "Irish Blessing" on the next album. Several years ago (maybe five or so) I went to a concert given by Ralph in Swindon. It was after the release of "Sand in Your Shoes". After the concert I was first in the queue for him signing albums and told him that I was disappointed that he hadn't sung " Irish Blessing". He said that he found it so emotional to sing (his oldest kids were at the age when they were just leaving home) that he had never been able to perform it live! I found this so touching and it gave an extra special meaning to the song. I continues to request the song and I think it must have been two years later that he sang it at a concert for me. I love the words. I love the music. I love his voice, and I love the sentiments. 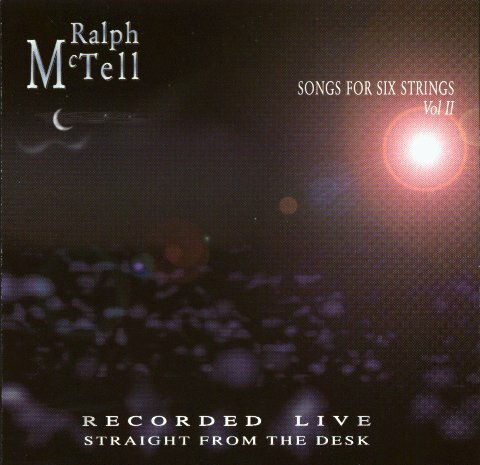 I would love to list my favorite live versions of Ralph McTell songs, but since I live in the US I have never had the opportunity to see him live. Can you encourage other US fans to respond? We need to band together to get Red House to bring him over here. I live in the U.S. and have not seen Ralph live, but do hope that he will consider a tour here (New York City). Since "In The Bleak Midwinter" is one of my favorite songs, I'd love to hear Ralph's rendition of this classic. I'd also love to hear a live version of "Heron Song" as well as "Sand In Your Shoes" added to the next "Songs for Six Strings" release.